The first-of-its-kind study, by NIAS, Bengaluru, could have huge implications for areas such as anthropology and evolutionary biology. Bengaluru: In a first-of-its-kind study, researchers at the National Institute of Advanced Studies (NIAS), Bengaluru, have found a unique behaviour in monkeys that could be a precursor to human language. According to the scientists, the animals seem to exhibit a complex process of intelligence: the ability to understand and display intent — the basic building blocks of language. Such a study on a wild, untamed population interacting with humans hasn’t been done before, and could have huge implications for fields such as anthropology and evolutionary biology. This finding possibly pushes back the time period since we thought animals were capable of developing precursors to a language, possibly preceding even our ancestral ape family. A major question in the study of human evolution is how, why, and when we came up with the idea of a language we can speak. These are puzzles anthropologists, palaeontologists, and linguists are yet to satisfactorily answer. One of the ways we attempt to answer them today is by observing communication in other animals. Domesticated animals know how to communicate with us to a certain extent. Our dogs can tell us when they’re happy or hungry; our cows can tell us when they’re unsafe or angry, and our crows can caw our ears off when they want food. This kind of behaviour is observed in animals that are either pets, grow in urban areas with close proximity to humans, or are in captivity relying on humans for food. They are trained to behave a certain way to expect a certain reward. “It may well be that crows are reacting to a pattern of association with a particular window/person/time of the day, and matching them with the process of calling and getting food,” said Shreejata Gupta, former doctoral scholar at NIAS, and author of a newly published paper that studies primate communication with humans. “It may as well be that the food providers are reacting in the same way. Whenever the crow calls, they throw out food,” she added. That is a classic example of conditioning, put forward by Russian physiologist Ivan Pavlov: ring the bell, get the food. But there is a concept called ‘intentionality’: animals aren’t simply associating an action (caw) with a reward (food). They are grabbing your attention, ensuring they get it through various means, then add a sophisticated change in signal of request for food. Intentionality is a multi-layered action that signals a certain level of evolvement in cognitive intelligence. Intentionality in communication is the basic building block of developing a capacity for a language in humans. To observe how such precursors to language evolve, a wild animal population needs to be studied. The best kind of animals to study are non-human primates. This is what the team of Adwait Deshpande, Shreejata Gupta, and Anindya Sinha did. 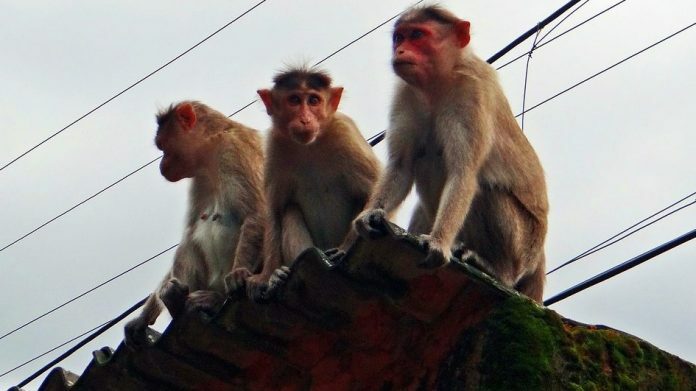 The trio observed two separate groups of the common south Indian monkeys, of the wild bonnet macaque species, to see how they ask for food from humans in Bandipur National Park, Karnataka. “Intentional behaviour requires for the signaller to have particular goals to achieve,” said Gupta. “And they persistently pursue to change the behaviour of the receiver, until their goal is achieved,” she said. 1. Macaques approached only humans who carried food. 2. They oriented their bodies repeatedly to come into the humans’ visual field. 3. They made “coo-coo” calls to attract attention. 4. When they established eye contact, they monitored it to ensure it held, before they extended their hand for food. “Intentional communication has been studied in apes earlier,” explained Gupta. “A few papers report intentionality in ravens and fish as well,” she said. The team’s previous paper on the subject was the first to report intentional behaviour within the macaque species itself. And in the new paper, they expound upon the monkeys’ interactions with humans. The wild bonnet macaques first ensure they take the effort to have the human’s attention on them, and then they make the gesture and vocalisations. “The gesture is definitely upon receiving the human’s attention, making the food requesting an intentional behaviour,” Gupta said. Such behaviour offers major clues into understanding the development and evolution of human language. But that isn’t all. Gupta thinks the biggest implications could be for the field of comparative psychology. “Communication behaviour is an expression of the cognitive processes,” she explained. “Results like ours give us a comparative understanding of the primate mind and how much they are capable of understanding others minds,” Gupta said. The study also leads to the possibility that monkeys quite likely learned these skills much before apes and other human ancestors did.